Use a chart to express your data in a beautiful, easy-to-read way and communicate with ease. This class explores the basics of creating and formatting charts, adding chart elements, and using new Excel 2013/2016 chart features. Take your Excel charting skills to the next level by learning even more about formatting, customization, and best practices. Bring your charts for recommendation and assistance. Learn how to summarize and aggregate large amounts of data with Pivot Tables, making Excel a valuable reporting tool after importing raw data from external systems or maintaining a large list. Attendees will learn how to report totals by categories and date ranges, and filter or sort those totals in a variety of ways, then those results into easy-to-read Pivot Charts. Attendees should be familiar with basic Excel features. After learning the basics of Pivot Tables, take your knowledge further with this class that explores additional features and analysis options to make the reporting of aggregate data even easier. PowerPivot is an add-in for Microsoft Excel that enables you to import millions of rows of data from multiple data sources, create relationships between heterogeneous data, create calculated columns and measures using formulas, and then further analyze the data quickly and painlessly. 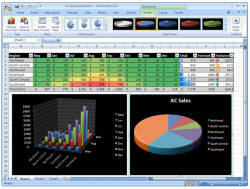 This class will demonstrate how to create compelling, attractive spreadsheets. Through the use of spacing, borders, font, and color, participants will observe how a simple spreadsheet can be designed to be more easily understood and accepted by the reader. Take your workbook skills to the next level in this class that focuses on Absolute References, Named Ranges, Cross-Worksheet References, and more. By popular demand, this class on Excel’s VLOOKUP function will help you pull selected data from a table. We’ll also explore intermediate use of the IF function with related functions AND and OR. Knowledge of advanced functions like Indirect, Row, and Column will help users create dynamic worksheets that can extend the functionality of a spreadsheet. Index and Match work like VLOOKUP to query information from a worksheet. Not for beginners! Excel provides a wealth of formulas to deal with dates and times. Learn how to use them in this short class with a timely focus. Participants will create their own time card sheet. Excel has over a dozen functions to get more out of text-based columns. Learn how to split and combine text (including full names), convert text to upper or lower case, remove or find duplicates, and more. Excel’s power is greatly magnified by three features: Goal Seek, Scenarios, and Solver. Goal Seek will easily allow you set the value of a particular cell based on a desired outcome at another cell. Take that to the next level with Solver, which allows you to create a number of constraints and variables to reach a desired outcome. Scenarios let you easily report on a number of what-ifs by identifying cells to watch including variables and objectives. Macros are recorded steps that can be played back to make repetitive tasks much easier. In this introductory class on Excel Macros, participants will learn how to record, view, share, and make minor changes to an Excel macro. After reviewing the basics of Excel macros, we'll cover Visual Basic for Applications (VBA) which lets you extend the power of macros by giving you limitless control over Excel. Learn how to automate nearly anything. Basic macro experience is required. After reviewing the basics of VBA, we’ll dive into loops, variable declaration, error handling, and more. Basic VBA skills are required.